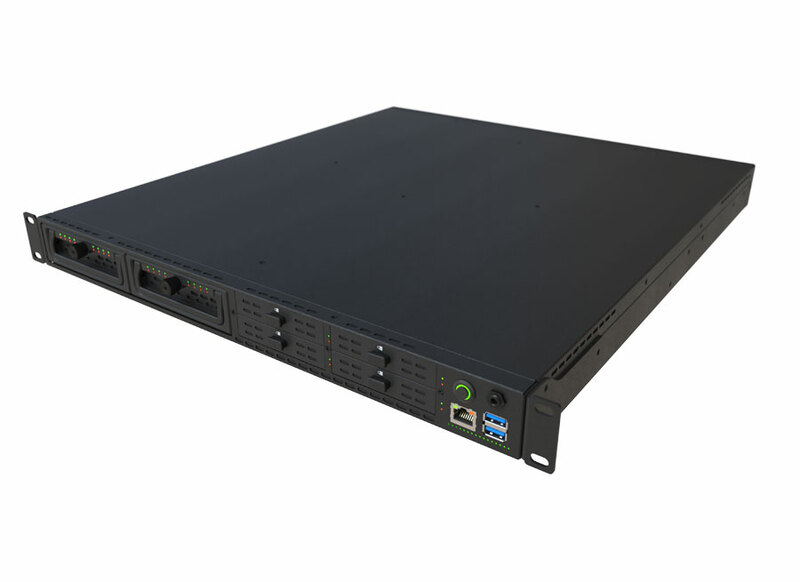 The S1U401-SHS secure storage server “Hurricane” is an ultra-rugged, 1U rack mount, lightweight Intel® Xeon® “flash server” system with expandable and removable Direct-to-disk™ storage at the drive- and cartridge-level, with 12x or 24x 1GbE Ethernet ports and dual QSFP+ sockets for 10/40 Gbits/s Ethernet add-in modules. The Secure High Speed Storage (SHS) in Hurricane integrates with high-performance processing, encrypted and removable RAID storage, networking, high speed I/O, and a MIL-SPEC power supply plus an optional APU in a small, ultra-rugged 1U high rack-mount enclosure with the greatest possible performance per dollar and per watt. Speed and security are the basis for Hurricane. Flash solid state disks (SSDs) coupled with the Intel® Xeon® E5 and PCIe/SAS/SATA 3rd generation busses make this the fastest “flash server” in the rugged market. General Micro Systems’ SecureDNA™ software suite, firmware and system architecture assure that data is protected at-rest and in-flight via RAID controller-side encryption. As well, total system erasure is accomplished via externally- or internally-triggered zeroize (sanitize) Secure Erase operations. The 1U rack-mount S1U401-SHS Hurricane secure storage server is three complete sub-systems packaged together: rugged rack mount Xeon® server, multi-port Ethernet, and Direct-to-disk™ cartridge storage with secure, encrypted and removable RAID-controlled flash SSD drives. Hurricane is intended for military/defense/aerospace networks where one server can power up to 36 virtual machines (18 core Xeon®) and perform network functional virtualization (NFV) using 14 Ethernet ports (2x 10 GbE and 12x or 24x 1 GbE) with either two or four inter-server 10/40 GbE fiber ports. The removable drives are ideal for encrypted sensor storage such as C4ISR missions where data is streamed via LAN or add-in I/O to the encrypted drives then removed post-mission for analysis. With the onboard 1 and 10 Gigabit Ethernet ports, Hurricane is an ideal forwardly-deployed vehicle-mounted battlefield server, SIGINT/ELINT platform for recording data and distributing it to multiple Ethernet LANs. Ethernet ports provide LAN connectivity, CPU-based bridging, and multi-node connectivity. Removable drives with optional encryption provide NAS and software-defined storage that scales with system requirements.